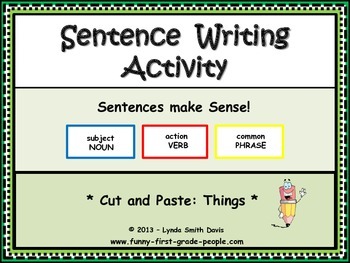 “Sentence Writing Activity – Cut and Paste: Things" is a quick and easy literacy center activity. The focus is on helping students “make sense” out of sentence writing. Being physically engaged helps younger students succeed. Manipulating the materials helps them build good eye-hand coordination skills, as well as the fine motor skills necessary for reading and writing. 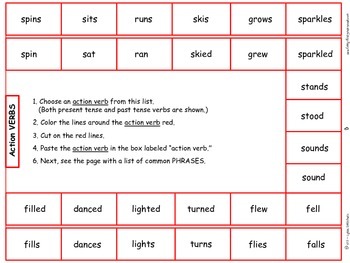 Color-coded (subject) nouns, (action) verbs, and common phrases provide for faster and more effective student comprehension. The student chooses, and then cuts and pastes together a sentence that makes sense. As an extension, the student will illustrate the sentence, and then name its main topic (the subject). Ten worksheets – with graphics - are included. 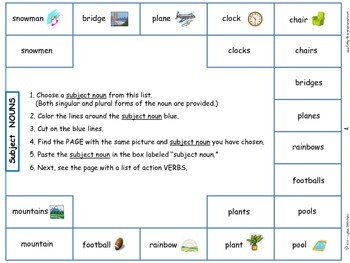 Note: Both singular and plural nouns are provided, as well as both present and past tense action verbs ... The student should make sure that the subject and verb agree. Suggested use is for second and third graders - and for any others who may benefit from the hands-on practice of sentence writing. 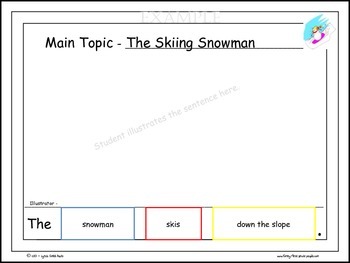 Extension: For a bulletin board display, add an eye-catching headline above their work (e.g., The Skiing Snowman).